“1st Episode Impressions” is an article series which focuses on the very first episode of any particular anime. It gives my thoughts and opinions on how it introduces itself, whether-or-not I believe it will be good based on its opening episode, and acts as a comparison point for my review. 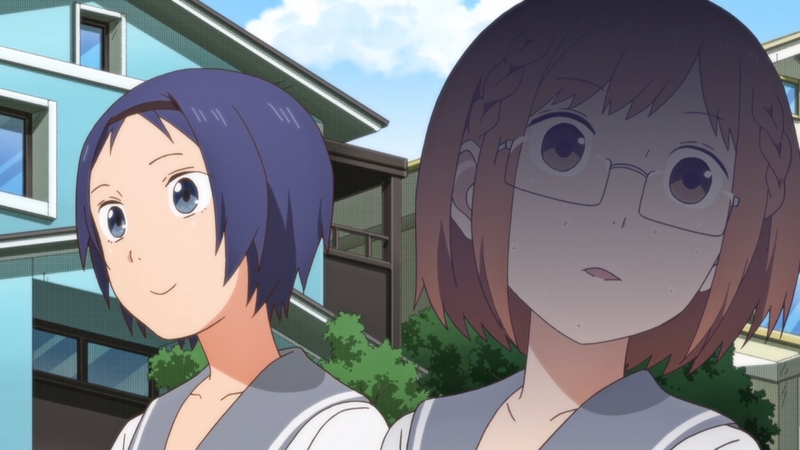 The first episode of Chio’s School Road, “Because School is There / Chio-san and Hosokawa-san”, is a two-part episode that features two different stories. The way that this anime chose to split up their episodes into different parts over the course of a single episode reminds me anime like “Karakai Jozu no Takagi-san“. While I know this is something minor, I tend to do well with these types of anime because it provides “extra” episodes inside of a single one (at least that is my feeling on it). The anime itself focuses on Chio Miyamo, a school girl who is socially awkward, part of the Soft Tennis Club and spends her time late night gaming and trying to make it to school on time. The first part of the episode sees our orange-haired protagonist make a detour on the way to the school due to her usual route being blocked (with an Assassin’s Creed video game reference) and the second has her encounter Yuki Hosokawa, a popular girl who is apart of the school’s Track Club. This anime is definitely a comedy slice-of-life; it makes references to geek culture, has incessant monologuing by our main protagonist, and situations that are meant to be humours and awkwardly embarrassing in their nature or execution. I find these type of anime particularly funny as it was the main thing that made me want to watch the anime Nichijou. 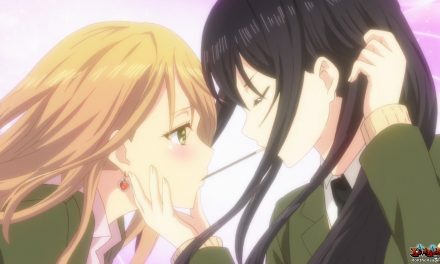 Chio’s School Road is not taking itself too seriously and I believe it has found by focusing on the main character’s social anxiety and placing multiple stories within one episode, that it will have a winning formula. Chio herself seems like a decent character when alone; she figures out the best way to avoid situations (via “Game Brain”), is relatable, and the biggest thing about her character is that she does not come off as completely hopeless. However, I feel her interactions with people is a bit too nervous and plays too much on the stereotype of gaming shut-ins being oddballs around other people. FINAL IMPRESSION — My final thoughts is that this anime series is promising. It seems to have everything necessary to succeed, but I feel in order to be a worthwhile series it will have to evolve Chio as it progresses forward. One of the worst things about comedy style anime is no progression of the characters involved. I want to see new and better situations that focuses upon new problems and gives those problems solutions through use of comedy and awkward situations. Chio’s School Road definitely has promise, just need to make sure it follows through on the good groundwork its made in episode 1.